This dictionary contains terms concerning veterinary medicine in general, infectious, parasitic and non-infectious diseases, and anatomy and physiology of domestic animals. These veterinary terms formerly appeared in the "Dictionary of Animal Production Terminology" of the European Assocation for Animal Production, published by Elsevier in 1985. During the preparation of a new edition of this dictionary, it was decided due to the increasing specialization in animal production and of the associated terminology, to divide it into two volumes, one devoted to animal husbandry terms and the other to veterinary terms. Consequently, specialists in animal production and in animal health who have to work in many languages should consult not only the present volume, but also its companion volume which deals with animal production. 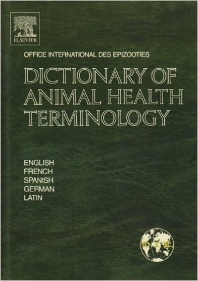 The dictionary will be a valuable reference tool for all those engaged in animal health who have to work in four languages.